Update: We have even more concrete details on the new TCL 8K Roku TV, the X10 QLED. We've added them below and where to buy the new 6-Series 4KTV starting today. The TCL Roku TV 8-Series is the best evidence that 8K resolutions are here in 2019, with the affordable television manufacturer demoing its first 8KTVs at CES 2019. The new TCL 8KTV will come in big screen sizes, 75 inches and larger, according to the Chinese TV manufacturer. In the US, it'll use the intuitive Roku TV interface we have lauded in the past. In the UK and other regions, TCL will have the TCL X10 QLED with Android TV and Google Assistant built-in as well as Amazon Alexa instead of Roku. TCL's new AI platform, dubbed TCL AI-IN, will bring up the right sports game with your favorite team when you command it to "turn on the football game." Granted, you almost certainly don't have 8K content for a television like this to take advantage of the 7,680 x 4,320 (33.2 megapixels). So TCL is touting the lead feature of its Roku TV 8-Series like this: "upscaling performance to skillfully convert today’s 4K and full HD resolution content that delivers a new sense of depth and clarity." It'll also be future-proofed for when 8K resolutions do become mainstream, with the company noting that it'll support for the latest HDMI standards. This probably means HDMI 2.1, which we're expecting to see across the board on new 4KTVs at CES this week. The TCL 8K TV display supports a wide color gamut display, approaching 100% of the DCI-P3 color space coverage, Dolby Vision, and the ultra-contrast control zones we've seen on TCL's higher-end 6-Series televisions. It has a theater-level soundbar from Onkyo with Dolby Atmos, which may mean you won't need a separate soundbar solution. Yet it'll remain simplistic design, says TCL, with its thinnest point being 14.5mm. It's one of the thinnest 75-inch direct backlight products in the industry, reducing optical distance to 4mm. 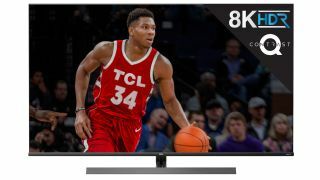 TCL has yet to announce the price for its 8KTV. And given the fact that its 8-Series TV sizes are a vague "75 inches and larger," we may have to wait closer to its 2nd Half of 2019 release before before we know how much it'll cost. The TCL Roku TV 6-Series is also getting a big upgrade in terms of size. This HDR-equipped 4KTV is going to stretch to 75 inches a few months after maxing out at 55 and 65 inches. We really liked the 6-Series, enough to give it 4.5/5 stars and out Great Value badge. However, you'll be paying a higher price for the larger 75-inch set. It'll cost less than $1,800 through Best Buy starting today, according to the company. Other retailers will get it in the coming weeks. By comparison, the 55-inch TCL Roku TV 6-Series costs $599.99 right now, while the 65-inch set jumps to $969.99. These prices were a bit lower during Black Friday and Cyber Monday – and we'd wager they'll drop in price at various retailers as TCL's newer TV sizes and resolutions take hold (see Amazon Prime Day 2019). Without a doubt, the 75-inch 6-Series is TCL's most expensive television yet, at least until that 8-Series 8KTV launches in the second half of 2019.